I found an old screenshot today and thought I’d share it to give you an idea of (1) how bad my design eye is and (2) some history of After the Deadline. After the Deadline started life as a web-based style checker hosted at PolishMyWriting.com. My goal? Convince people to paste in their documents to receive feedback on the fly, while I made tons of money from ad revenue. It seemed like a good idea at the time. PolishMyWriting.com did not check spelling, misused words, or grammar. It relied on 2,283 rules to look for phrases to avoid, jargon terms, biased phrases, clichés, complex phrases, foreign words, and redundant phrases. The most sophisticated natural language processing in the system detected passive voice and hidden verbs.I wouldn’t call it sophisticated though. I referenced a chart and wrote simple heuristics to capture the different forms of passive voice. Funny, it’s the same passive voice detector used in After the Deadline today. This rule-based system presents all of its suggestions (with no filtering or reordering) to the end-user. A hacker news user agreed with 50% of what it had to say and that’s not too bad. After the Deadline today looks at the context of any phrase it flags and tries to decide whether a suggestion is appropriate or not. A recent reviewer of After the Deadline says he agrees with 75% of what it says. An improvement! 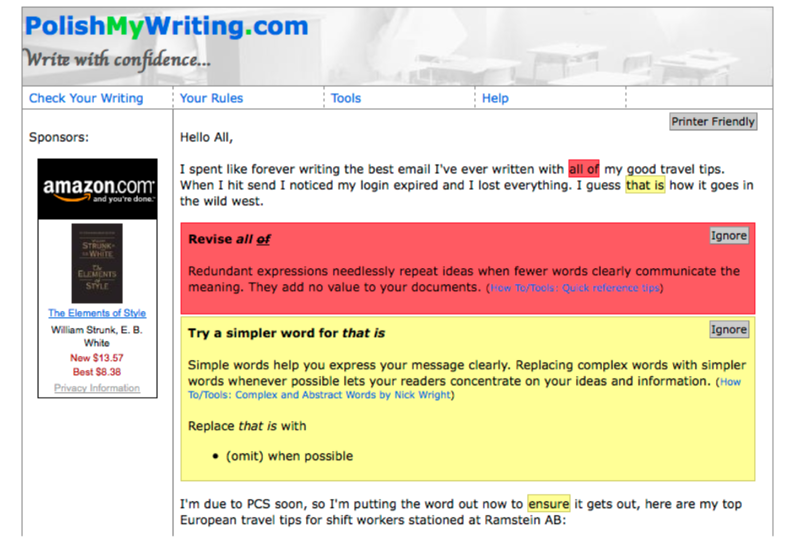 My favorite part of PolishMyWriting.com was how it stored rules. All the rules were collapsed into a tree. From each word position in the document, the system would the tree looking for the deepest match. In this way PolishMyWriting.com only had to evaluate rules that were relevant to a given position in the text. It was also easy for the match to fail right away (hey, the current word doesn’t match any of the possible starting words for a rule). With this I was able to create as many rules as I liked without impacting the performance of the system. The rule-tree in After the Deadline today has 33,331 end-states. Not too bad. 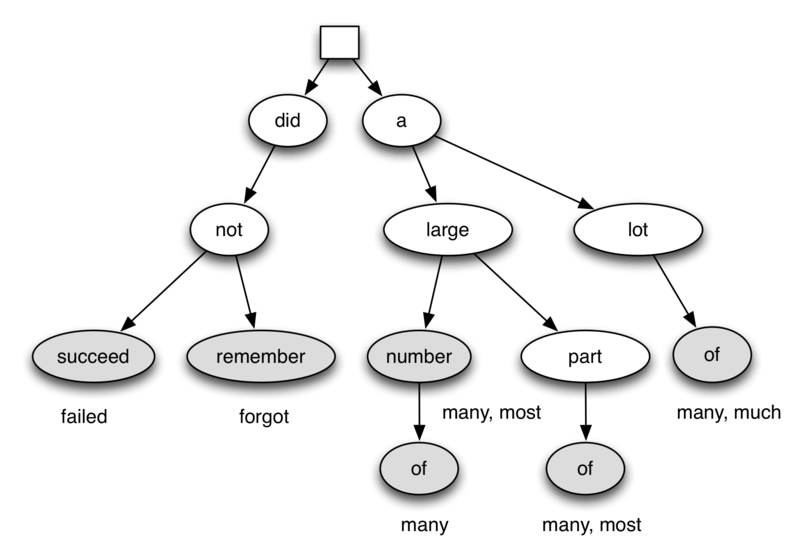 The rule-tree above matches six rules. If I were to give it a sentence: I did not remember to write a lot of posts. The system would start with I and realize there is nowhere to go. The next word is did. It would look at did and check if any children from did in the tree match the word after did in the sentence. In this case not matches. The system repeats this process from not. The next word that matches is succeed. Here PolishMyWriting.com would present the suggestions for did not succeed to the user. If the search would have failed to turn up an end state for did not succeed, the system would advance to not and repeat the process from the beginning. Since it found a match, the process would start again from to write a lot of posts. The result I [forgot] to write [many, much] blog posts. I eventually dumped the PolishMyWriting.com name. Mainly because I kept hearing jokes from people online (and in person) about how great it was that I developed a writing resource for the Polish people. It stills exists, mainly as a place to demonstrate After the Deadline.